I have taken a closer look at the monthly data for temperature, relative humidity and CO2 concentrations. 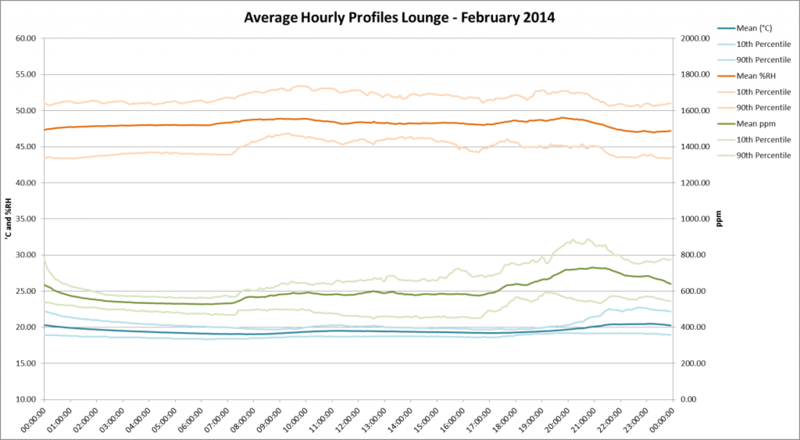 The previous post considered mean monthly values, whereas the charts in this posting give the hourly averages during February 2014. In addition to the mean value, I have also charted the 10th and 90th percentile values to illustrate the ‘bandwidth’ for the observed conditions. This chart shows the mean hourly conditions in the bedroom in February. The temperature (blue) has a mean of 18.2ºC, with a very small mean deviation of +/-0.6ºC between 10th and 90th percentile. This constant temperature means the comfort conditions are excellent – no more waking up feeling cold in the middle of the night. Relative humidity is also near optimal with a mean of 52% (should ideally be between 40 and 60%). Again, there is a small mean deviation of +/-3%, indicating that the ventilation in the bedroom is sufficient for managing metabolic moisture levels. Note, that the ‘blip’ that occurs at around 0900hrs (and on temperature) is when the sun passes over the sensor. 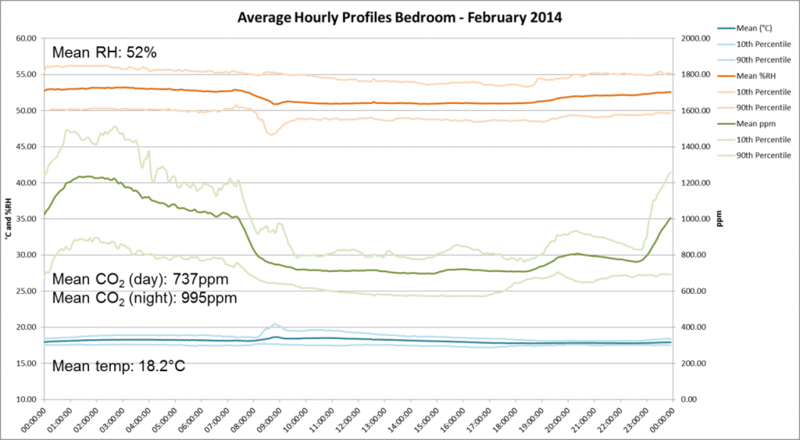 The CO2 levels show that the bedroom is in use typically from 11pm through to 7am. The mean values for daytime are from 7am through to 7pm and show that the mean CO2 concentration is 737ppm. During the night (7pm to 7am) the mean is 995ppm. The 24hr mean is 865ppm and is within guideline values of 800-1000ppm (mean) and 1500ppm peak. The 90th percentile shows a peak of approximately 1500ppm at around 3am. This may be the cause for some debate amongst my contemporaries, but I don’t believe that a 1500ppm peak in a bedroom is a problem. Many bedrooms concentrations that I have seen elsewhere peak well above 2500ppm. At 5000ppm, CO2 concentrations are likely to lead to drowsiness, but the longer-term risk is that other, more toxic, pollutants will also increase. But, in reality, I am not too bothered if the 1500ppm peak CO2 makes me drowsier at 3am. I would add that, since the ventilation system has been commissioned (and fine tuned), the conditions in the bedroom in the morning are ‘fresh’. Before the renovation, and particularly in winter when the windows were closed, it was notably ‘stuffy’ and stale in the mornings. Not any more. The kitchen and living room charts are posted here too. They too show the performance is doing well. But, for brevity, I won’t go into too much detail with these charts – they tell their own story in a way. But briefly, the living room shows a slightly warmer temperature, compared to the bedroom and kitchen. This is due, in part, to the occasional use of the wood burner. The 90th percentile indicates the wood burner benefit from 8pm onward. 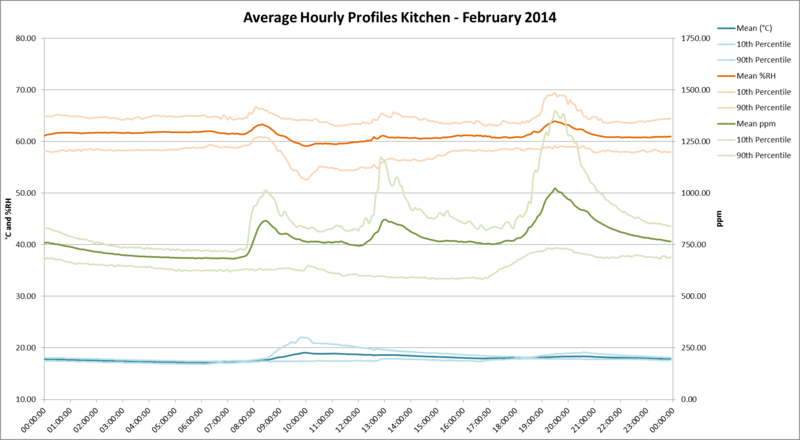 CO2 levels in the kitchen show when we are preparing meals for breakfast, lunch and dinner, with concentration levels peaking at around 1400ppm. Do drop me a line if you have queries. I plan to post more on comfort conditions through the year, so keep checking back. This entry was posted in Monitoring and tagged CO2 Concentration, Relative Humidity, Temperature by Ian Mawditt. Bookmark the permalink.